Find and compare the best prices from a range of well known car rental companies at Murcia Airport. This is a free to use facility, enabeling you to book direct with the company quoting the price. 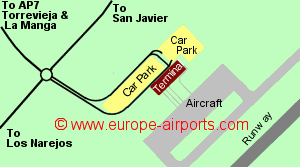 Murcia Airport, otherwise known as San Javier Airport, is located 40Km South East of Murcia, on the Western side of the Mar Menor, serving the Costa Calida. 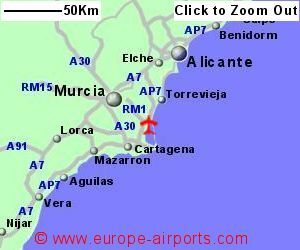 Murcia San Javier airport closed to commercial air traffic on 15th January 2019, when the newly built Murcia International airport at Corvera finally opened.Sorry but we do not have any details of flights from the UK or Ireland to Murcia Airport.